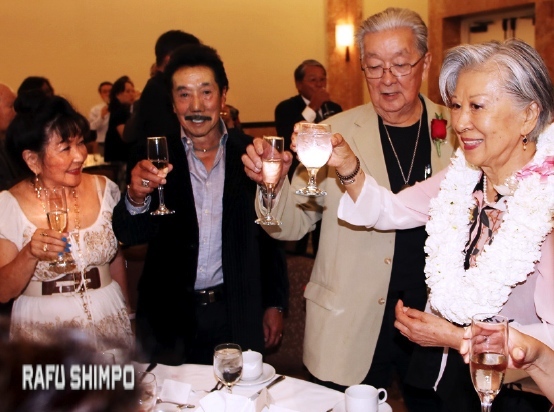 The Nisei Week Foundation’s annual Awards Dinner was held Monday at the DoubleTree by Hilton in Little Tokyo. 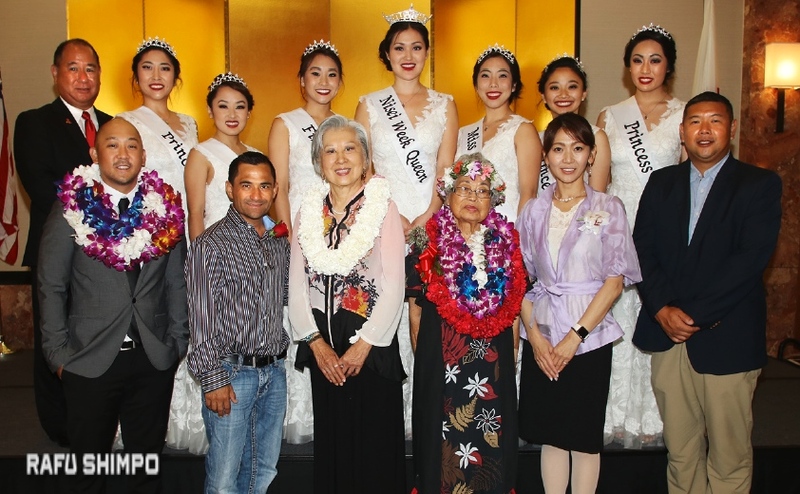 Pictured above: (front row, from left) Inspiration Award recipient Brandon Ito; Parade Marshal Corey Nakatani; Grand Marshal Rose Matsui Ochi; Inspiration Award recipient “Auntie” Marian Chun; Natsuko Tanose, representing Frances K. Hashimoto Community Service Award recipient Nishiyamato Academy of California; Kazu Kinoshita, representing Frances K. Hashimoto Community Service Award recipient Day-Lee Foods Inc.; (back row, from left) Nisei Week Foundation President Leiton Hashimoto; the 2017 Nisei Week Court — Princess Kaitlin Hara, Princess Tom I Okuno, First Princess Yurika Yoneda, Queen Jordyn Adachi, Miss Tomodachi Kelly Sera, Princess Claire Imada, Princess Jordyn Terukina. Other speakers included Ellen Endo, Little Tokyo Business Association; Deputy Consul General Kazutoshi Hayashi; Jeff Yamazaki, Japanese Chamber of Commerce of Southern California; James Okazaki, dinner chair; Pastor Sunyoung Lee, Centenary United Methodist Church. Right: Rose Ochi, her husband Tommy and other guests drink a toast.